A lot of people have to travel on a daily basis, whether it's for vacation and leisure or for business. While there are many mental and emotional benefits to traveling, it can also take its toll and cause physical and mental fatigue especially for long-haul flights. Due to minimal physical activity on-board, the joints and muscles feel stiff and the blood flow suffers. Fortunately, there are yoga poses that can help frequent travelers overcome these physical strains and be ready for their next leg of journey. The yoga poses I list below are easy to do, require minimal or no props, and help the practitioner to quickly recover from fatigue, allowing the body to return to its natural rhythm. Here are my recommendations of yoga poses for frequent travelers. This pose helps in stretching the hamstring and lower back, providing good blood flow to the brain. This also helps ease headaches, which many travelers often experience. You can do this pose by placing your hands in front of you on the wall or if you can, reach for the floor and bend your knees a little if the stretch feels too intense. Bend from the hips and remain in this pose in this pose from 30 seconds to 1 minute. For a more detailed how-to, click here. If you feel that traveling sapped you of energy, this pose will help you instantly. Aside from the energy boost, it also helps in opening up the hips, chest, and shoulders. For support, you can also do this pose with your hands on your lower back as you slowly bend backward. Take four to five deep breaths while you remain in this pose and look at the ceiling as you come back to your normal position. This pose can be done even while you are actually onboard. This seated exercise helps in opening up the hips and glutes while helping to reduce the pressure on your knees. Pick one of your legs and bring the thigh as close as possible to your body. Keep the spine straight and take 3-5 deep breaths. Do it with the other leg and then repeat on both sides for five times. To help counter the effects of being strapped in a seatbelt for hours while traveling, this pose will bring movement and muscle engagement back in your legs, glutes, arms, and core, and improve circulation. Get the step-by-step and learn how to do Chair pose here. If you have long commutes everyday, you will love this pose as it helps in stretching the back, improving stability and balance, and strengthening the core. It's a simple pose and can be done literally anytime and anywhere. You can choose to bring your hands up toward the ceiling or bring them together in front of your chest in prayer position. 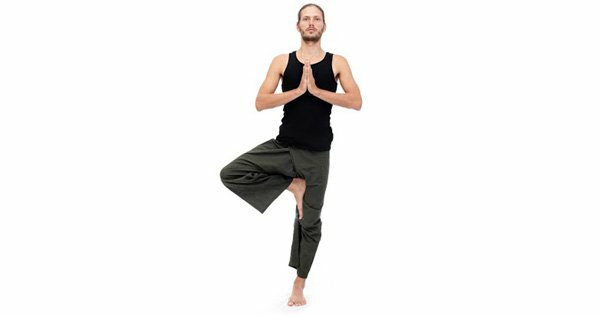 If you feel you won’t able to stand on one foot, you can choose to do this pose close to a wall so that you can support yourself whenever needed. If you can't place your foot on the opposite thigh or above the knee, lower it down to the shin/calf. Make sure you don't place your foot directly on the opposite knee. For more tips to practice it safely, click here. These are just some of the yoga poses that are easily doable even while in transit, and can help ease the pain or discomfort you experience when traveling. It's also recommended to do some stretches and exercises before and after a long flight (try these yoga poses) so you can stay mind-body healthy during your travels.